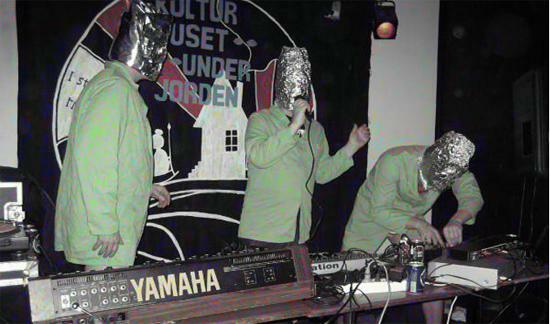 BleeD Music & Xenoglossy are to bring long-running Swedish trio Frak across to London for a rare UK performance this weekend. It's set to take place at Hackney's Yard Theatre this Saturday, July 13th, and also features Helena Hauff and Dungeon Acid. The group will probably have been unfamiliar to most (the Quietus included) until last year, when an increased focus on club music producers toying with analogue machinery and noise turned wider attention towards them - it's an aesthetic they've been mining with pretty staggering results since the late 80s. Frak tracks don't quite sound like anyone else - all cyclical drum machine patterns, hiss, distortion, frayed acid lines and warped synthesiser moans that bend back on themselves to deliciously psychedelic effect. Those traits are put to the service of all kinds of styles: off-kilter synth-pop tracks, punishing splatterfests (check out 1993's excellently titled 'Alice In Acidland'), and druggy, mood altering dance music. After an older track of theirs was pressed on a 12" on Germany's excellent Workshop label last year, they put out a series of new releases - including the Deep Twist EP through their own Börft label, which riffed on wonky techno and woozy Italo ideas, and the Muzika Electronic album via Digitalis. For a taste of what they're like live, check out this live recording, hosted on mnml ssgs, of a set from last year. On the night they'll be joined by Dungeon Acid, aka Jean-Louis Huhta, who will be playing a live set, and Helena Hauff. The latter has recently released an (already sold out) mixtape via Blackest Ever Black's tape sublabel Krokodilo Tapes, and is about to release a killer trio of scorched, acidic techno tracks through Actress' Werk Discs label. She's also a resident DJ at Hamburg's Golden Pudel club. Click here to listen to her upcoming Werk track 'Actio Reactio'. For more information and to pick up tickets for the night, click here.